Most of our posts are about mounting stuff but after using Waze for the past month, thought it was worthwhile to pass a quick review of this incredible app on to our readers. Waze is a GPS application available on IOS and Android. What sets Waze apart from the hundreds of other GPS apps is the integration of maps, technology and community based feedback to provide a driving experience that will save you time and tickets. I remember a company ten years ago that tried to do this using cell phone transmissions. Needless to say, they didn’t last long as the GPS units cost around $500 so usage was minimal. Take a look at the screen shot that accompanies this post. It highlights a part of the Route 80 corridor in Northern New Jersey. The little policeman head indicates there is a police presence. Waze received this information from an alert driver (or hopefully passenger) that saw the issue and notified Waze. The cat with the crown is a fellow Wazer a mile away. This is tracked by Waze’s computers using your GPS coordinates passed to Waze by your phone. If you need gas, there’s a BP nearby as seen in the upper left. This is a screen shot taken on a Saturday night so you don’t see a lot of activity on the screen. If it were during the day on a weekday, you would see far more activity as Route 80 is a parking lot during rush hour. You will also see some rather interesting activity as the app permits Map Chat where drivers who don’t know each other can strike up chats. You see a lot of that going on at around 6PM on Route 80 West here in Northwest New Jersey. Set your destination into the application and it will provide the most optimal route using current traffic patterns. Garmin, TomTom and others can do this too however what sets Waze apart is the extreme granularity of incident reports and the integration into the route calculation. 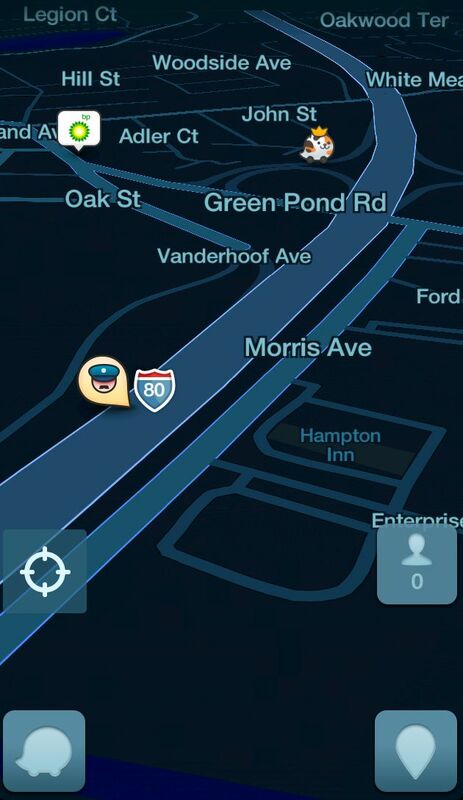 Wazers report everything from a car in the shoulder to a traffic jam to a police officer giving a ticket to someone. You can verify the presence back to Waze by clicking the thumbs up or by clicking ‘not there’ as you drive by. As traffic conditions worsen or improve, Waze will change your route to get you to your destination faster. As an incentive for using Waze, they award points based upon your miles driven and for reporting incidents or providing map corrections. You are then ranked versus other Waze users. You can also provide Waze with access to your Facebook friends and it will rank you against them as well. Accumulate enough points and get to wear a crown on your cartoon car. I guess this is a way to provide incentive to their users without costing Waze (now Google) any money. Similar to Gas Buddy and a few other similar services, Waze provides gas prices in your vicinity. Click the station of choice and the app automatically routes you there. Did I mention all of this was free? I was trying to figure out how this app company could be profitable as ads are very seldom. Then I read that Google purchased them for about $1 billion. Makes sense if they integrate it into Google Maps which I suspect is their plan. While I wholeheartedly recommend this application, I do have concern about the allure of interacting with the application while driving. It can be as dangerous as texting while you drive so leave the incident reporting to your passengers or use the integrated voice function. If you would like to read a good article on phone mounts which will make using Waze more fun, you may view it here.